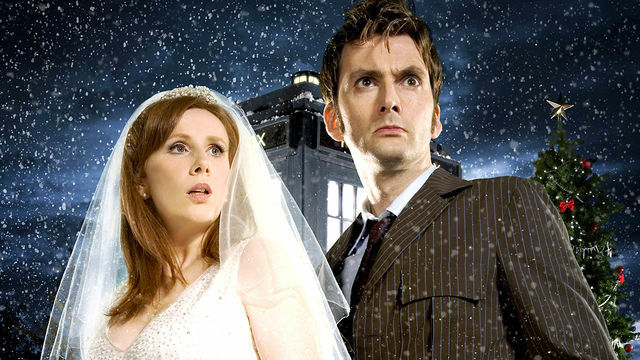 Rose might not be in The Runaway Bride but the Tenth Doctor is haunted by her throughout this story. Her departure certainly seems to have cut the Doctor to the quick but in these more emotional days I suppose he can't be seen to get over her instantaneously. She's not Dodo after all. So for this story the Tenth Doctor gets a temporary companion, Donna Noble (Catherine Tate). Donna is the titular Runaway Bride. Very loud is Donna. Very shouty. It was the loudness of the performance that was to put one or two people off the idea of her return but that was to forget that this was supposed to be a one off performance. Still Catherine Tate is good. She's funny, she does confused exceptionally well and she also does the quiet moments well. The scenes at the end of the episode are brilliantly played with David Tennant. Her horror struck realisation at the Doctor's final solution to the Racnoss problem and her command for the Doctor to 'find someone' because he sometime he needs someone to stop him are both nicely played. But only a fool would think that because Catherine Tate was - at this point - best known for being a comedian that she couldn't act. Donna says that she scares him and I'm reminded of a scene from a 1995 American film called 'Prophecy', which features angels at war with one another. Christopher Walken plays the Angel Gabriel. It's fab. Anyway there's a scene in that film where the hero, Thomas Daggett (Elias Koteas) is talking to Katherine (Virginia Madsen) and says: "Did you ever notice that in the Bible whenever God needed to punish someone...or whenever God needed a killing he sent an Angel. Do you ever wonder what a creature like that must be like...always with one wing dipped in blood. Would you ever really want to see an Angel?" And that always reminds me of the Doctor in this story (and as the Time Lord Victorious later.) It is a reminder perhaps, post-Rose, for the viewer of what the Doctor might be capable of without the companionship of humans. That the gap between The Doctor and The Master might not be a big as we sometimes think it is. He's a Gallifreyan after all. He can see the big picture and he's almost certainly got"One wing dipped in blood." But mostly he's on our side, which is good. Imagine what The Doctor must look like to a Dalek or the Empress of the Racnoss? But that is perhaps to take the whole thing far too seriously, which I'm allowed to do occasionally. It's my blog. So The Runaway Bride is a nice bridge from the old season to the new. It gives the Doctor a bit of post-Rose moping but reminds him of what's out there walking in the dust. Catherine Tate is good and it doesn't get quite as cheesy as some later Christmas specials are inclined to get. There's some darkness here, which I like.